Nitrogen inputs to the Gulf of Mexico have not diminished since 1990, and there has been no abatement of the problem in the five years since the 2001 Gulf Hypoxia report was issued by the government. Since 1990, the major nitrogen loading factors in the MRB have remained level or increased, while mitigating factors have decreased. Fertilized acres have increased, fertilizer use has increased, total atmospheric nitrogen deposition has increased, and population has increased. In 2002, over 16 billion pounds of fertilizer nitrogen were applied in the MRB. Meanwhile, the amount of land set aside for conservation has decreased. Of these factors, fertilizer inputs are the most significant input of nitrogen to rivers and streams of the MRB, and in fact, actual fertilizer application rates are probably even higher than we have estimated them to be in this study. We compared our fertilizer use estimates, which were based on USDA cropping data multiplied by USDA state-level fertilization rates, to industry data on actual fertilizer sales. Fertilizer sales data are unavailable for some states, so it is not possible to estimate the trend of total sales in the MRB, but we were able to perform state-by-state, county-by-county comparisons of the two databases for the most important agricultural states. Even after subtracting non-agricultural fertilizer sales, state-level fertilizer sales figures significantly exceeded our estimates of fertilizer use in most cases. Our analysis shows that fertilizer runoff is the dominant source of nitrate to the Gulf in the spring, contributing around 70 percent of the total and accounting for about 7.8 million pounds of nitrate-nitrogen per day during the peak loading period. By the time this nitrate reaches the Gulf, losses due to denitrification have reduced the fertilizer load to about 5.4 million pounds. Municipal waste sources account for about 11 percent of nitrate loading, atmospheric nitrate deposition for about 6 percent, and animal waste for about 12 percent. Consideration of some nitrogen flux estimates from other sources helps put these findings in perspective. A 1996 EPA estimate for total N discharged from all point sources (i.e. municipal and industrial) in the MRB was 642 million lb as total N in a year (Tetra Tech, 1998). Expressed as a daily flux, this value would only account for a fraction of daily nitrate flux to the Gulf in the spring, even if all the municipal nitrogen was produced as a nitrate, which it is not (Mueller and Helsel 1996). However, while the importance of point source loadings to the Gulf is less than nonpoint source loadings, the importance of municipal and industrial discharges to local water quality and ecosystem health should not be downplayed. These sources of nutrient pollution occur year-round, and can be the dominant source of nutrient inputs in watersheds with a high population density. Similarly, animal wastes from confined animal feeding operations are important point sources of nitrogen to local water supplies, but in the context of fertilizer applications, these inputs are relatively small contributors to net nitrogen flux to the Gulf. While yearly production of nitrogen in animal waste is about 38 percent of nitrogen applied as fertilizer, animal waste production is distributed throughout the year, unlike fertilizer application, which occurs during discrete periods of the fall and spring. Additionally, a large amount of nitrogen in animal wastes can be lost to the atmosphere via ammonia volatilization (Meisinger and Randall 1991, cited in Goolsby et al. 1999). To the extent that volatilized nitrogen is redeposited as atmospheric ammonium deposition in the same general vicinity as the concentrations of animals, its influence on water quality should presumably be detected by the model. Yearly atmospheric nitrate deposition does not exceed about 5 lb/acre in the MRB, compared to fertilizer inputs, which averaged over the landscape can reach over 80 lb/acre. However, the overall importance of atmospheric nitrogen sources is probably more important than our model indicates. We did not include atmospheric ammonium deposition in our model, because unlike atmospheric nitrate, which is mostly derived from combustion sources, atmospheric ammonium is chiefly derived from agricultural sources (NADP 2000), and we wanted to avoid "double-counting" of these sources. Additionally, we did not include the organic component of nitrogen deposition, or dry deposition. In eastern watersheds, such as the Chesapeake Bay region, atmospheric N deposition may be an important source of N inputs to rivers and estuaries (Alexander et al. 2000b), and can be a significant threat to forest health (Driscoll et al. 2001). Our analysis indicates that for the years 1995-2002, fertilizer runoff accounted for about 70 percent of total nitrate flux to the Gulf in the spring. In these years, farms in 5 percent of the MRB produced about 40 percent of the nitrate load from fertilizer. Farms in ten percent of the MRB accounted for 65 percent of fertilizer nitrate loading, and farms in 15 percent of the MRB were responsible for 80 percent of fertilizer nitrate loading. The areas most responsible for nitrate pollution generally have high fertilizer use rates on farmed land, and a high proportion of the total land area in fertilized agriculture, although the amount of runoff and proximity to major rivers also influence how large a source of nitrate flux any particular area is (Alexander et al. 2000a, Donner et al. 2004). Clearly, certain areas contribute disproportionately to fertilizer runoff, and they are mostly in the Corn Belt. There are three major factors at work. First, the response of riverine nitrate flux to fertilizer inputs on a whole watershed basis shows a threshold, occurring around 30 lb/acre, at which nitrate flux becomes abruptly worse. If fertilizer use is expressed in terms of the proportion of total watershed acres under fertilized agriculture, the threshold occurs between 30-40 percent. Conceiving the landscape and its rivers and streams as a sponge that soaks up fertilizer runoff, with unfertilized areas and wetlands "buffering" inputs to rivers by incorporating nitrogen biologically or facilitating its transformation to gaseous forms via denitrification, then there is clearly a point where the sponge is saturated, and begins to discharge nitrate. Destruction of wetlands and riparian forests especially reduces the capacity of the watershed to protect rivers and streams from nutrient inputs. However, similar threshold dynamics have been observed in other systems where land conversion was not the issue. Experimental evidence suggests a threshold can arise because of limited ecosystem capacity to absorb added nitrogen (Johnson 1992, Perakis et al. 2005), and the phenomenon of "nitrogen saturation" from atmospheric deposition is well documented in the US and in Europe (Tietema et al. 1998, Lovett et al. 2000, Fenn et al. 2003), as atmospheric nitrogen overwhelms ecosystem retention capacity. Another reason that the Corn Belt contributes so much nitrogen to the Gulf is that many of the highest fertilizer-input areas in the Midwest occupy land that is normally too wet to farm. To make land arable, farmers install tile drains, buried perforated pipes that convey soil water quickly away from the field and into drainage ditches. Nitrate-nitrogen concentrations in tile-drained water can be high, exceeding 40-50 ppm (the drinking water standard is 10 ppm nitrogen as nitrate). For example, about 35 percent of Illinois' agricultural lands are tile-drained (USDA 1987, cited in David et al 1997), greatly increasing fertilizer runoff from these areas. Finally, the high fertilizer-input, tile drained areas already implicated for fertilizer runoff are also located relatively near large, main stem rivers of the MRB, so there is less opportunity for in-stream denitrification of nitrate, once it reaches a river (Alexander et al. 2000a, Goolsby et al. 2001). Denitrification is a bacterially mediated process which converts biologically available nitrate to gaseous forms, where it is no longer available to fuel algal growth. In aquatic systems, denitrification occurs chiefly in sediments, thus denitrification losses are higher in small, slow-moving streams with a high ratio of sediment to water contact than in large main stem rivers with a high velocity and high volume. Increasing time-of-travel for source waters to the Gulf also increases the probability of denitrification (Alexander et al. 2000a). Total commodity support payments to farms in the MRB were $59.7 billion between 1995 and 2002, while conservation payments were $8.5 billion. The 124 counties that comprised the 5 percent of the MRB with the highest rates of spring fertilizer runoff received 17 percent of commodity support payments allocated in the MRB, but only 8 percent of the conservation subsidies. A key feature of these commodity subsidies is that they pay farmers to grow only a few different crops, primarily corn, wheat, cotton, and soybeans. A full 45 percent of commodity payments go to corn, which typically requires the highest fertilizer inputs of any major crop. Hence it is not surprising that the map of spring nitrate flux resembles the map of commodity payments very closely, since areas that receive corn subsidies constitute the most significant sources of spring nitrate pollution. Fertilizer runoff to the Gulf costs farmers an average of $270,000,000 each spring. These figures take into consideration the actual types, prices, and amounts of fertilizers used in each year between 1998 and 2002. Since 2002, the last year for which we calibrated our model, fertilizer prices have risen considerably due to the energy costs of production. Applying current fertilizer prices to the amounts of fertilizer flushed into the Gulf for the modeled years of 2001-2002 shows just how much fertilizer runoff is currently costing farmers: an average of $391,000,000 per spring runoff period. The figure for yearly losses is even greater, since for the limited number of sites where we had year-round data, year-round nitrate flux was about 1.7 times greater than spring runoff. However, it is important to note that because nonpoint pollution is coupled to runoff, the relative importance of fertilizer as a source of nitrate changes over the course of the year, making it difficult to attach an exact dollar figure to the cost of fertilizer runoff year-round. Between 1995 and 2002, total commodity payments to farmers in the MRB were $59.7 billion, while total conservation subsidies were $8.5 billion. However, commodity subsidies can increase dramatically in certain years, while conservation spending has remained flat. For the peak years of 1999-2000, commodity subsidies in the MRB averaged $13.28 billion a year, a 260 percent increase over the previous three years, while conservation subsidies averaged just $1.21 billion a year, essentially unchanged from the previous period. Far more farmers want to participate in conservation programs than can currently be accommodated. The Wetlands Reserve Program (WRP) funds long-term protection and restoration of wetlands by land owners. In 2004, farmers in three states that are the source of much of the nitrate to the Gulf — Illinois, Iowa, and Indiana — applied for about $124 million more in assistance than was granted under this program (all data on unfunded applications are from USDA's Natural Resource Conservation Service website). The Environmental Quality Incentives Program (EQIP), which helps farmers pay for conservation practices on working lands, was underfunded by about $235 million in those same three states. The Gulf hypoxia assessment estimates that 5-13 million acres of wetlands will need to be restored in the MRB to effectively reduce nitrogen loading to the Gulf (Mitsch et al. 1999, 2001), compared with current acreages, which are considerably lower. For example, there are about 1.85 million acres of land supported under the "wetland practices" component of the Conservation Reserve Program in the major states of the MRB (FSA 2004), but the majority of these (84 percent) are in the states of Minnesota, North Dakota, and South Dakota, none of which contribute significantly to nutrient pollution entering the Gulf. While restoring wetlands and bottomland forests to the levels needed to improve water quality will represent a significant commitment, the many benefits will outweigh the costs even in the medium term. Besides helping to remove nutrients and other contaminants from water, wetlands provide significant flood-control benefits (Hey and Philippi 1995), the value of which cannot be overestimated under scenarios of increasing precipitation in the MRB (Lins and Slack 2005) and the known property costs of previous floods. Wetlands and restored riparian forests would also provide habitat and miles of connected corridors for wildlife, fish, and migrating birds, as well as the intangible aesthetic benefits of a diversified and living landscape. Farmers and land owners appreciate these values as much as anyone, as shown by the tremendous (and presently unmet) demand for funding to assist in conservation and restoration efforts. Our modeled estimates for spring nitrate flux to the Gulf are well correlated with USGS measured values. For the years 1990 to 2002, our estimate averaged 84 percent of the measured flux for the months of March-June (R2 = 0.60) and 90 percent of measured flux for the April-July period (R2 = 0.85). The model estimates nitrate loading to rivers in the MRB for the months of March-June, but that water actually arrives at the Gulf weeks later, which probably explains the tighter relationship between our flux estimates and flux measured just above the Gulf in the April-July period. Additionally, inputs to our model consist of the current year's nitrogen inputs to the MRB, thus the model is likely to underestimate the response of nitrate flux to runoff events that mobilize nitrogen stored in soils and groundwater (Goolsby and Battaglin 2001, McIsaac et al. 2001, Scavia et al. 2004, Turner et al. 2006). Evaluating our findings in the context of other nitrogen loading models for the Gulf also suggests that our results are robust. Because our model characterizes nitrate flux in the spring, while other models tend to characterize either total nitrogen or nitrate on a year-round basis, direct comparisons are difficult. Nonetheless, the basic conclusions are qualitatively similar. The USGS SPARROW model, which describes annual total nitrogen flux to the Gulf in the late 1980s (Smith et al. 1997, Alexander et al. 2000a), calculates total N flux at about 13.4 million pounds a day, with the largest proportion — 49 percent — coming from fertilizer runoff. A further 18 percent comes from atmospheric deposition, 14 percent from livestock wastes, 6 percent from point sources, and 13 percent from nonagricultural sources, such as forest soils. Just 24 percent of the land area accounts for 71 percent of the total N flux. The model of McIsaac et al. (2001, 2002) accounts for 95 percent of the variation in yearly nitrate flux to the Gulf for the years 1960-1998, the period over which fertilizer use and nitrate loading increased dramatically (Goolsby et al. 2001). Their model takes into account not only nitrogen inputs to the MRB in the current year, but finds a significant effect of "residual" nitrogen from previous years, which is particularly susceptible to loss when precipitation and runoff are high. They note an apparent threshold for net anthropogenic inputs at which nitrate flux to aquatic systems becomes abruptly worse, similar to our observations, and conclude that a 14 percent reduction in fertilizer inputs in the past could have achieved a 33 percent reduction in aquatic nitrate loading to the Gulf (McIsaac et al. 2002). Other models of N loading in the MRB have also suggested the importance of a threshold beyond which the terrestrial and aquatic systems can no longer retain nitrogen inputs. Donner and Kucharik (2003) note that modeled nitrate flux increases sharply once fertilizer inputs exceed amounts that crops can use, a situation which is common in cropping systems where farmers over fertilize as a form of "insurance". Goolsby and Battaglin (2001) used the proportion of land area under crops as an input to one version of their nitrogen loading model, noting an apparent threshold for total nitrogen flux as cropped area increases. Nitrate flux is related to the specific crops grown, since cropping patterns largely determine fertilizer use. Donner (2003) found as cropland cover increases, total nitrogen flux also increases, and that nitrate comprises a greater proportion of total nitrogen when corn is a major crop. Three primary crops — corn, soybean, and wheat — were estimated to account for 86 percent of nitrate leaching for the 1990-1994 period, despite accounting for less than 20 percent of land area in the MRB (Donner et al. 2004). Importantly, the influence of soybean was found to be ambiguous. As a nitrogen-fixer, soybean requires less fertilizer inputs than other crops, and studies indicate that it uses residual nitrogen in soil (David et al. 1997, Donner et al. 2004), suggesting it should therefore contribute little to nutrient leaching from soils. However, because it is typically grown in rotation with corn, it is difficult to separate the "signal" of corn and soybean when nitrate flux is evaluated in the context of crop cover (Donner et al. 2004). Our analysis, which expresses all crops strictly on the basis of fertilizer inputs (by multiplying acres grown by fertilizer application rate), avoids this problem. There are two main approaches to reducing N loading to streams: reduce the amount of fertilizer applied at the watershed level; and manage the landscape to more effectively absorb and denitrify the fertilizer that does run off fields. Our analysis, as well as other similar models (Goolsby and Battaglin 2001), indicates that for watersheds where the proportion of land area under fertilized agriculture exceeds a certain threshold, there is an abrupt increase in the amount of fertilizer that runs off into streams and rivers, but in watersheds below that threshold, nitrogen export in rivers is much less. In the watersheds that produce the most fertilizer runoff, the proportion of land in any kind of conservation program tends to decline as the proportion of land in fertilized agriculture increases - just the opposite of what is needed to intercept and denitrify fertilizer runoff. Our analysis suggests that because fertilizer runoff increases abruptly once fertilizer use passes a certain threshold, the amount of land in conservation also needs to increase in a non-linear fashion to "keep up" with runoff. Even in the most heavily fertilized areas of the MRB, diversifying land use to increase the proportion of land in conservation or low-intensity uses like pasture can dramatically improve water quality. Most effective will be the restoration of natural streamside vegetation and wetlands, which intercept nitrogen runoff and facilitate denitrification. 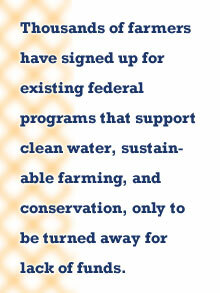 The Conservation Reserve Program (CRP) is by far the biggest federal conservation program for agriculture. The majority of Conservation Reserve acres in the MRB are in the western part of the basin, which is in any case not a major source of nitrogen loading to the Gulf. The CRP was originally conceived as a means to take highly erodable land out production, and has been successful where it was deployed, but its original intent was to preserve soils, not protect surface waters against nitrogen loading. Adequately funding conservation incentive programs that support farmers' efforts to reduce runoff pollution on working lands would not only improve water quality, but also allow a broader sector of the farming community to enjoy the benefits of subsidy payments. Programs already on the books, such as the Environmental Quality Incentives Program (EQIP), have major backlogs of unfunded applications, showing that farmers stand ready to do their part. Ultimately, funding such programs will represent a net savings, given in the improvements in local and regional water quality that could result. The large amounts of commodity support dollars allocated in the known hotspots of agricultural nitrate pollution is money already being spent. In some cases, it supports dramatic overproduction, as was the case in 2004 and 2005 when farmers lost millions of bushels of corn to spoilage because they could not find tarps big enough to cover the piles (Barrionuevo 2005). Redirecting some of these dollars to conservation and riparian restoration would involve little if any additional expense. There is a plethora of data to show that farmers who follow best mangagement practices — testing soils for nitrate before applying fertilizer, timing applications to track crop needs — use less nitrogen than those who don't. Recent data from USDA (Kim and Quinby 2004) demonstrates a reduction of 4 percent in the amount of fertilizer applied when farmers pre-test soils, but that only 17 percent of soils are tested. Excess fertilizer entering aquatic systems has a detrimental effect in the environment no less than a toxic substance would. Farmers should be required to submit a nutrient management plan, showing that they plan to use fertilizer responsibly, as a condition for receiving taxpayer subsidies. Cuts in funding at the USGS, the source of most water data used in models of the MRB, have meant that long-term monitoring at many sites has ceased. Data are no longer collected at many of the flagship monitoring sites that were used in the federal Gulf Hypoxia Assessment's nitrogen loading model (Goolsby et al. 1999), the results of which have been used to formulate the "Action Plan" for Gulf remediation. The National Research Council's recent report on the state and prospects of water-related research in the nation sounds an alarm that the US is dramatically under prepared for the water quality issues we face in the near future (NRC 2004). Water quality is declining in both populated and unpopulated areas throughout the nation due to ever-increasing agricultural pollution, industry, population growth, logging, mining and suburban sprawl, thus restoring funding to the federal agencies charged with water quality monitoring is an urgent priority.